If one add one equals two, and two add two equal four, then why are there so many mathematicians unemployed? Could it be because none of them have the good sense to pick up this comic book created by Jim Starlin, Yvel Guichet, and Chris Batista? Or could it be because DC Comics had them all blacklisted in April, 2014? To QUOTE Robert Bridges: 'The storm is over, the land hushes to rest. The tyrannous wind, its strength fordone, is fallen back in the west'. Now I'm not quite sure how to say this to you, Jenny, but as you know, recently I've been able to acquire a very powerful artefact I've been dying to get my hands on for ages. However, now that I actually have it within my grasp, I've come to the realization I don't possess the natural telepathic ability to wield it, whereas you do. So what I want to ask, Jenny, is if I give you this item, would you spend the rest of your life with me, please? Your old pal, Extremax! Or alternatively, would you turn down my offer and go back to your comrades in Stormwatch? Well, my friend. The choice is yours. After I finished reading this issue of 'Stormwatch, entitled ''Power', a phrase suddenly popped into my mind that somehow defined this story-line as well as some of the incidents it ultimately conveyed. That phrase was, 'Silly yet sweet'. Well, if I'm going to be honest with you, dear reader, I do feel that this apt expression suits this penultimate chapter to a tea. For instance, that scene where Extremax propositioned Jenny was 'silly yet sweet' both in tone and in content. Then in that other scene where Hellstrike and Force talked about their mutual history together -- which was very good to read by the way -- that was 'silly yet sweet' during it's bittersweet aftermath. Furthermore, I found that scene where Control confronted the Shadow Lords 'silly yet sweet', especially when the Lords coined the human expression, 'rush job', just to convey how they constructed him by using the Martian Manhunters DNA. Oh! And while I'm on the topic of the previous version of this team, I did like hearing that their existence was finally acknowledged in this book, even though I don't think anything will be made of that revelation. Ha! I suppose the only thing I didn't really like about this adventure is how it was structured into two distinct halves, with the each of them seemingly acting independently from the other. Obviously this was done on purpose, so Jim could finally wrap up his run on this book, and give each of the characters something to end on. So, 'no biggie' there then. If you want to know why I've paired-up this adventure to the theme tune for 'The Wheel of Fortune' then please read the following section for more details, Ha! Now that scene where Extremax presented Jenny with the offer of staying with him for all of eternity, has compelled my mind to go a bit silly for the moment, and compare this comic book to one of those quiz shows where a host offers one of his contestants to, 'open a box', 'stick or twist', or 'yadda-yadda-yadda'. OK. So that is it, folks. The New 52's version of 'Stormwatch' is finally getting the old heave hoe. Sh*t! It's a shame to see it go. I had so many high hopes for this team book when it was first introduced two and a bit year's ago. And now, well, I suppose I could have guessed what was going to happen to it when DC lost its grasp upon its concept. Anyway. Let's turn our frowns upside down. 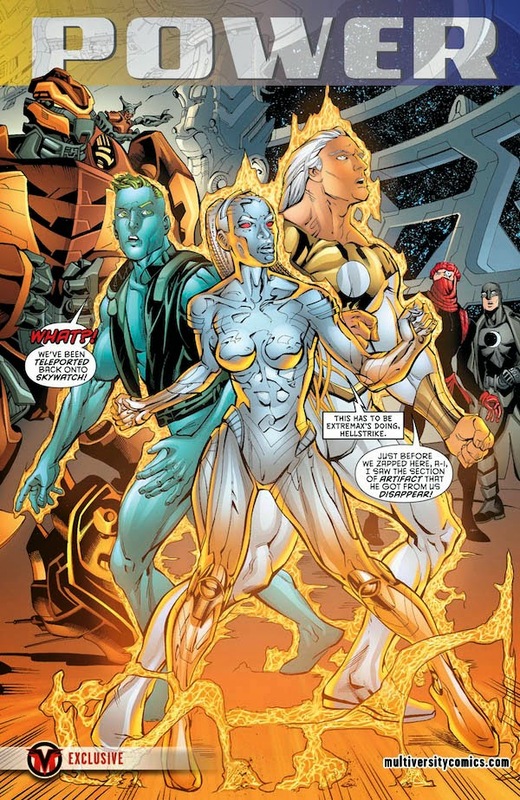 There is no need to moan or gripe, because Stormwatch aren't dead. 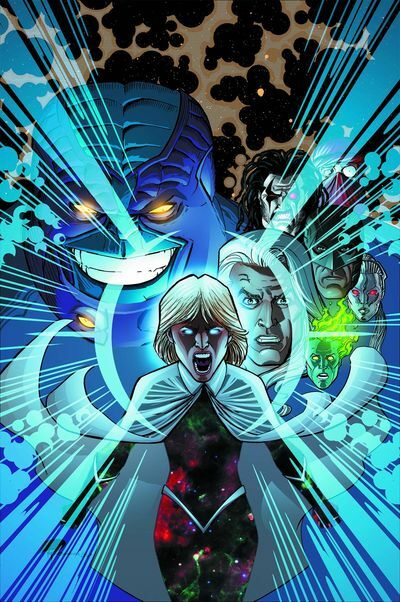 In fact, they will be appearing in some sort of weekly event DC are staging, spearheaded with next issues grand finale. But before then, please allow me to rattle off a few things I've learned whilst reading this series. Chin straps are for life, and not just for Christmas. Little girls and malevolent forces can become the best of friends if they want to. If you draw 'The Weird' incorrectly, he comes across like a very playful Arab in ill fitting garments. Electrical components can have feelings too. Homosexuals are good at fighting in space. Names may have meaning, yet they don't necessarily need to make sense. No matter what book he appears in Lobo is always a scream. Don't worry about messing up your life, worry about cosmic deities removing you from existence. Never give DC a great concept to play with because they won't be able to market it properly.